If you look closely at the inlay work you can see how many different tiny pieces go to make up the pattern. Amazing. Sorry about the reflections and grotty wall. This piece would cost thousands of dollars. It is beautiful Marnie. It looks a little similar to the inlaid work in the Florence museums. wow, it is amazing, I wonder how long it took to make this. 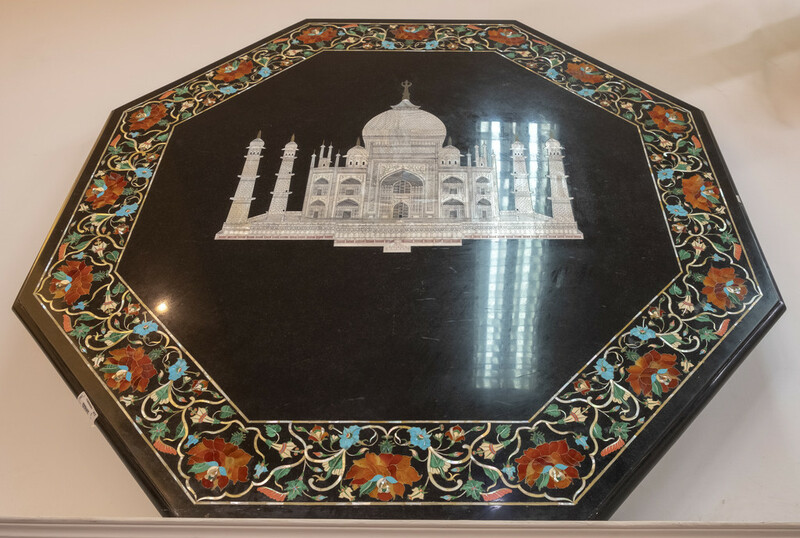 I can see why it would be so costly- the detail of the floral pattern is exquisite enough but add the Taj Mahal on top of that and this must have taken days to complete! @robz I haven't been fortunate enough to see that Rob, must be beautiful. @julzmaioro @gigiflower @joannakate @777margo Many thanks everyone. @onewing Weeks, if not months. @haskar @caterina @joysabin I would love to have bought it, but the price would have been too much for our budget. @olivetreeann Every bit is done meticulously by hand and eye Ann, my guess is that it took weeks if not months to finish this piece. @pdulis Thanks Peter, glad you liked the shot. Will check out the freebie too, many thanks. @gilbertwood @samae Isn't it just? We bought a piece, a relatively small piece which cost a fortune, especially to land it here. Will be posting a shot in due course. @merrelyn Just waiting for our friendly handyman to hang it (weighs 10 Kg! ).